Apple is having a press event on Thursday October 27, and you know what that means: New MacBooks! Finally. We’ve been waiting for this MacBook Pro overhaul for years. The event will be taking place at 1pm ET and we’ll be covering it as it happens. As always, Apple will be livestreaming the presentation on its website. You can watch with Safari for macOS, Safari on iOS, the Apple TV, or Microsoft Edge on Windows 10. As always, a lot of what we’re expecting to see has been leaked out. Here’s what to expect. Image: Martin Hajek - This is a design concept of what Apple’s new MacBook Pro with OLED touchscreen could look like. This is the big one. Apple is expected totally overhaul its 13-inch and 15-inch MacBook Pro notebooks. This is a big deal because the actual MacBook Pro design hasn’t been changed since 2012, when Apple rolled models with Retina displays. Since then, we’ve begged and pleaded with Apple to release something worthy of replacing the 2012 MacBook Pro with Retina display. Back in May, analyst Ming Chi-Kuo from KGI Securities reported that Apple was going to overhaul the MacBook Pro, making it thinner and offering an OLED touchscreen above the keyboard. The touchscreen will sit where your function keys sit on the MacBook Pro now, and will dynamically change, based on what apps you’re using and what is on your screen. Cult of Mac later obtained “spy photos” of the chassis, showing off where the OLED touchscreen will sit. Update: Apple actually leaked the images of the new MaBook Pro itself in the latest release of macOS Sierra. The image confirms the new OLED touch screen at the top, which basically means the Escape key is dunzo. The MacBook Pro is also expected to add USB-C ports and Thunderbolt 3 ports for faster connectivity. In fact, a recent Macotakara report suggests Apple will only have USB-C ports on the MacBook Pro. Apple could even get rid of MagSafe, its long-patented (and very useful) power adaptor, and use just USB-C. When it comes to internals, Bloomberg reported back in August that the new MacBook Pro would use AMD graphics. As for processors, Apple could go with Intel’s sixth-generation Core Skylake chipset or it could update to the new Kaby Lake processors. We’d love to see Kaby Lake MacBook Pros, especially after waiting this long, but it might come down to yields. Although the MacBook Pro is expected to be the big star of the event, Apple is also expected to update the MacBook Air. Though it might have lost its thin and light crown to the MacBook, it’s still Apple’s best-selling notebook. It’s also Apple’s most affordable. Both Bloomberg and Macotakara report that the MacBook Air will be updated with USB-C and Thunderbolt 3 support. 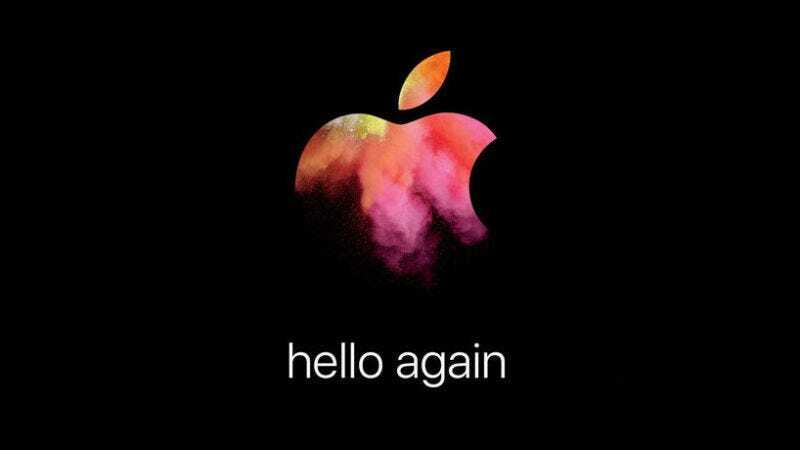 The actual hardware design, which Apple has used since 2010, is expected to be the same. The screen is not expected to get an upgrade, so if you want Retina, you need to pony up for a MacBook or MacBook Pro. Macotakara also reports that Apple will be getting rid of the 11-inch MacBook Air, leaving only the 13-inch model in the lineup. Bloomberg reports that Apple will update its 4K and 5K iMacs with faster processors. This makes sense, since Apple did the same thing last year. It’s possible the iMac could also get USB-C ports, though we are really hoping to see some Thunderbolt 3 love. Graphics on the iMac are also expected to get a boost, thanks to newer chips from AMD. Back in June, Apple discontinued its beautiful Thunderbolt Display. The discontinuation was notable because there wasn’t another product in Apple’s lineup to replace it. For years, professional users who use 4K displays have asked where Apple’s first-party solution might is. The problem is that in order to successfully drive a 5K display, you need powerful graphics, something a lot of MacBooks just don’t have. Back in June, 9to5Mac reported on rumors that Apple was working on a 5K display with an external GPU, in order to drive that needed performance. We just might see it this week. If Apple does roll-out Thunderbolt 3 across its laptop line, that could pave the way for a 5K display with built-in GPU. Apple hasn’t updated the Mac Pro since its release three years ago. Unfortunately, it doesn’t look like the Pro machine will get an update, even thought the addition of USB-C and Thunderbolt 3 would be very welcome to pro users. Similarly, the Mac mini hasn’t had an update since October 2014. The Mac mini is a low-volume seller, but plenty of users rely on it for an inexpensive Mac; it’s also often used as a server. Sadly, the Mac mini isn’t expected to get an update this time. Apple overhauled tvOS for the fourth-generation Apple TV last month, but it’s expected to release a new TV guide-like feature called the “Watch List” during Thursday’s event. The feature, first reported by Recode back in August, is supposed to be designed to help people find out what to watch on the the various channels and services they have subscriptions to. Content discovery is a very real problem in the online streaming space, so this sounds like a good idea. Unfortunately, it looks like Netflix won’t be one of the supported services/channels, which may limit how useful the feature is for a lot of users. With any luck, the feature will launch alongside the single-sign on feature promised at WWDC, but delayed last month.